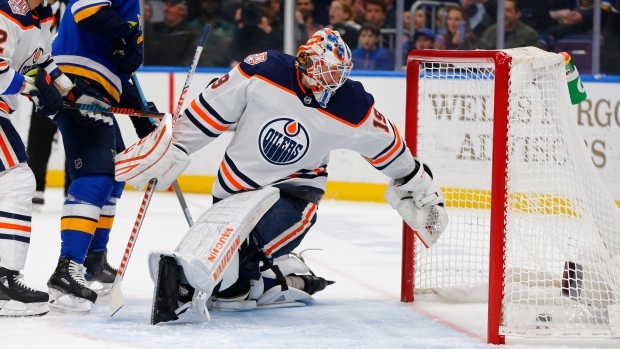 Edmonton Oilers starter Mikko Koskinen was pulled in the second period of Tuesday's 7-2 loss to the St. Louis Blues after allowing three goals on 20 shots. Koskinen also gave up six goals on 34 shots in Sunday's loss to the Vegas Golden Knights, but Oilers head coach Ken Hitchcock said the team will continue to rely on him as the starter. “He’s the guy we’ve hung our hat on and he’s had a really good outings and a couple of tough ones and every time he’s a tough one, he’s rebounded. This is another chance for him to grow and us to grow with him,” he said. “So many goals were going in - I just wanted to stop the bleeding,” he added. Koskinen was beaten three times on his glove side in Sunday's loss and was asked prior to Tuesday's game if he was having problems with his catching hand. “No, I don’t think that,” Koskinen responded, per the Edmonton Sun. “Last game (Vegas) scored three goals on my glove hand but that happens once in a while. It’s more about my positioning, getting my feet set up in time because the player at this level shoot where they see space. They don’t shoot if somebody is telling you to shoot glove hand. Oilers forward Ryan Nugent-Hopkins pointed out that Koskinen didn’t receive much help from his team in the loss to St. Louis. "It's not just special teams," he said of the Oilers struggles. "They were outshooting us 23-5 at one point in the second. Our game is the best when we're forechecking and we're creating loose pucks. Tonight we just got away from that a little bit and the other team did exactly that and they got rewarded for it." Koskinen's has a 22-18-4 record this season with a 2.89 goals-against average and a .908 save percentage. He signed a three-year, $13.5 million extension with the Oilers in January. Edmonton sits seven points back of the Arizona Coyotes for the final wild-card spot with just nine games remaining in their season.